In this blog, we will go over when a slip connection valve is used, the options you have when picking your slip connection valve, and the steps needed to properly install a slip connection valve in a sump pump, effluent or sewage system. 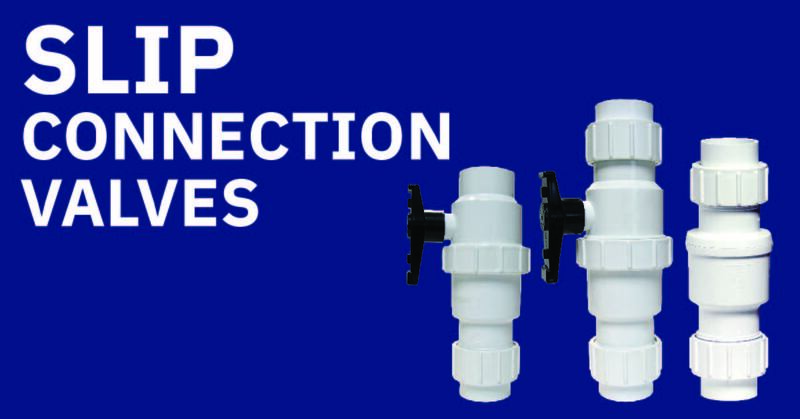 A slip connection is used when joining PVC or ABS plastic piping, a solvent weld connection is required and the use of a primer and /or a solvent cement is needed. Special transition solvents are required when PVC is joined to ABS. It is crucial that the manufacturers of the solvent cement installation instructions are followed to ensure a proper connection. Before installing you must design the system piping layout and determine which valve is best for your sump pump, effluent or sewage system. A PVC Swing Check Valve which provide reliable back flow protection, along with a designed angle seat to minimizes flow reversal, and potentially damaging hydraulic shock. A PVC Ball/Swing Combination Valve featuring both an in-line shut off and back flow prevention which makes it a compact option, along with a designed angle seat to minimizes flow reversal, and potentially damaging hydraulic shock. Both valves are available in a standard or quiet option. Set with this knowledge you are now ready to go through the steps to complete a slip connection valve for your sump pump, effluent or sewage system. #1 - Design the system piping layout and cut piping to the appropriate length. The proper location for the check valve is close to the floor level to both minimize the volume of water which drains back at the end of each pumping cycle, as well as to have the valve in a convenient location for easy inspection and servicing or replacement of the valve. Piping must not be smaller than the pump discharge. A minimum of 2 feet (0.61 m) of static head is recommended over the check valve for positive sealing. In an Effluent system, the pipe must be capable of handling semi-solids of at least 3/4” (19 mm) in diameter. In a Sewage system, a 2” valve MUST be used, and the pipe must be capable of handling semi-solids of at least 2” (51 mm) in diameter. VERTICAL installation is recommended when pumping solid free liquids. HORIZONTAL installation is critical when pumping solids or semi-solids, if necessary, valves can be installed up to 45°. Vertical installation could result in solids settling back down onto the valve preventing the flapper from opening on pump start-up. Some pump manufacturers recommend drilling a vent hole to prevent air-locking of the pump (typically located in the basin between the pump and check valve). Refer to pump installation instructions. #2 - Clean both pipe-ends and slip sockets of the valve. All parts that are to be solvent weld cemented must be clean of all foreign materials. #3 - Mark both the inlet and discharge pipes (refer to installation instructions for appropriate length). #4 - Locate the flow direction arrow on the valve body to ensure proper orientation of the valve from the pump. Best practice is to install valves in the VERTICAL position when pumping solid free liquids. When pumping solids / semi-solids valve must be installed HORIZONTALLY (up to 45° angle acceptable, see #1). Extra care must be taken to ensure the flow arrow points away from the pump and the check valve body is oriented as per the marking on the valve body “HORIZONTAL USE THIS SIDE UP”. Failure to position the swing check valve with the hinge of the flapper in the top center position will result in the valve not functioning properly. #5 - Wear gloves, solvent weld the pipe from the pump into the inlet connection of the valve, make sure the pipe is fully inserted into the slip socket. #6 - Solvent weld the outlet connection, make sure the pipe is fully inserted into the slip socket. #7 - Let connections cure. #8 - Properly support and restrain discharge piping, the pipeline must be restrained to prevent lateral movement by end blocking at direction changes and at any reduction in pipe size. #9 - TEST your connection to ensure a leak-free seal. Always refer to local building / plumbing codes to ensure the installation meets all regulations. The key to a dry basement is knowing that your sump pump, effluent or sewage check valve is properly installed, to protect and efficiently run your pump. Caution: If you are not comfortable installing these yourself, make sure that you get a certified Plumber to do it for you. If these products are not installed correctly, it may cause flooding and other issues. At BoshartU, our goal is to equip you and your team with the knowledge you need to be more successful. We regularly publish new blogs and content that will help you become more comfortable and confident with our products.